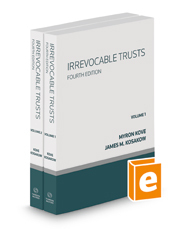 Home > Law Books > Treatises > Irrevocable Trusts, 4th, 2018-2019 ed. Irrevocable Trusts, 4th, 2018-2019 ed. You get the necessary forms, letters, wills, revenue rulings, and cases needed to help you weigh the pros and cons of your clients' needs and maximize their savings, plus visual aids to help you communicate information clearly.